Pizza the action. Or not. Ended up at Pizza East after last night’s Japanese beer fest – when you live near La Porchetta, it’s tough to find the motivation to try new pizza places, even when they’re not really new any more. The place smelled comfortingly of salami and, obviously, as per every review, the pizzas sounded amazing. Especially the ones with lardo, thyme and mozzarella, and rabbit, capers and olives. Hen pointed out to me that there was a particularly delicious tagliatelle which would fit my bill (with chestnuts, kale and pecorino – she’s a bit obsessed with chestnuts after Noma I think) but I was at Pizza East and dammit I was going to eat pizza. Of course, the menu was far too trendily sparse to feature any vegetarian symbols, so we had to play a brief game of “cured meat or fancy cheese?” with the waitress before I settled on one which, in a place less cool, would have been called the four cheese. It’s been a few years since I ordered one of those. 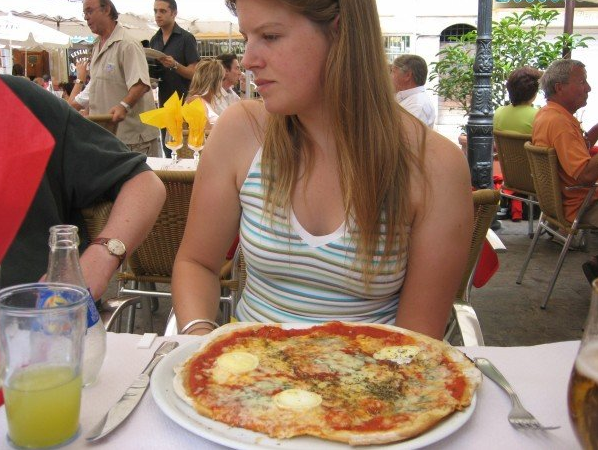 I did take some pictures, but the low lighting and the envy couldn’t even do a vegetarian pizza justice, so here a shot of the last time I went for aux quatre fromages – according to the caption, I’m looking mournfully at my dining companion’s steak tartare. Anyway, suffice to say, mine looked absolutely rubbish compared to the rabbit and lardo-studded numbers opposite (Hen could hardly contain her utter delight, Ben was kinder), and I was quite grumpy, until I tasted the crust, and realised I’d missed the point. Any topping, whether white truffle and gold dust or chinese chicken and pineapple, was mere detail beside this beauty. Chewy, perfectly seasoned and crunchy with polenta, I couldn’t even find it in my heart to resent my dining companions. By which you may infer that I enjoyed myself. I’ve not been to Pizza East yet but can’t wait to try it out. Probably won’t be going for the vegetarian option though! No, nor me next time, I assure you. Worth a visit, despite the hype.